All local authorities with their partner agencies must develop and publish local frameworks for assessment, which must be based on good analysis, timeliness and transparency and be proportionate to the needs of the child and their family. This guidance sets out the arrangements for how cases will be assessed once a child is referred into Children's Social Care in Lincolnshire. Each child who has been referred into Children's Social Care should have an individual assessment to identify their needs and to understand the impact of any parental behaviour on them as an individual. This is a Social Care Assessment and it replaces the Initial and Core Assessment and Pre-birth Core Assessment. Local authorities have to give due regard to a child's age and understanding when determining what (if any) services to provide under Section 17 of the Children Act 1989, and before making decisions about action to be taken to protect individual children under Section 47 of the Children Act 1989. In December 2018 Section 4, Communication was updated to include reference to parents with learning disabilities. A Child in Need is defined under the Children Act 1989 as a child who is unlikely to achieve or maintain a satisfactory level of health or development, or their health and development will be significantly impaired, without the provision of services; or a child who is disabled. In these cases, Assessments by a social worker are carried out under section 17 of the Children Act 1989. Children in Need may be assessed under section 17 of the Children Act 1989, in relation to their Education Health and Care Plans, disabilities, or as a carer, or because they have committed a crime. The process for assessment should also be used for children whose parents are in prison and for asylum seeking children. When assessing Children in Need and providing services, specialist assessments may be required and, where possible, should be coordinated so that the child and family experience a coherent process and a single plan of action. Please refer to the Lincolnshire Safeguarding Children Board Procedures Manual, Putting Children First (Meeting the Needs of Children and Families in Lincolnshire). To inform a plan to address those needs to improve the child's outcomes to make them safe. The Assessment should be led by a qualified and experienced social worker supervised by a highly experienced and qualified social care practitioner. Or in the case of a student social worker, the Assessment should be under the supervision of a Practice Supervisor. The parent's consent should be sought, before discussing a referral about them with other agencies, unless this may place the child at risk of Significant Harm, in which case the manager should authorise the discussion of the referral with other agencies without parental knowledge or consent. The authorisation should be recorded with reasons. If there is suspicion that a crime may have been committed including sexual or physical assault or neglect of the child, the Police must be notified immediately and a Strategy Discussion held. Where a child or parent with disabilities has communication difficulties it may be necessary to use alternatives to speech. In communicating with a child with such an impairment, it may be particularly useful to involve a person who knows the child well and is familiar with the child's communication methods. However, caution should be given in using family members to facilitate communication. NOTE: Where the parents have learning disabilities, it may be necessary to adapt communications to meet their needs – for further information, see the section on Good practice guidance on working with parents with a learning disability (2007) updated 2016. Children should be actively involved in all parts of the process based upon their age, developmental stage and identity. Direct work with the child and family should include observations of the interactions between the child and the parents/care givers, as well as utilising the Signs of Safety Tools. The Child's voice should be central to the assessments and planning at all times. All Assessments should be planned and coordinated by a social worker and the purpose of the assessment should be transparent and understood. There should be a statement setting out the aims of the assessment process, using the Signs of Safety methodology tools. The planning and direction of the Assessment should be collated in the Allocation Record and the Allocation Briefing held by the Supervisor and Practitioner. Please refer to the Case Holding Procedures for Student Social Workers, Allocation Record Checklist for further information of what should be considered in planning an Assessment. Assessment should be a continuous, dynamic process, which analyses and responds to the changing nature and level of need and/or risk faced by the child. A good assessment will monitor and record the impact of any services delivered to the child and family and review the help being delivered. Whilst services may be delivered to a parent or carer, the Assessment should be focused on the needs of the child and on the impact any services are having on the child. A good Assessment is one which investigates the three domains; set out in the Assessment Framework Triangle. The interaction of these domains requires careful investigation during the Assessment. The aim is to reach a judgement about the nature and level of needs and/or risks that the child may be facing within their family. 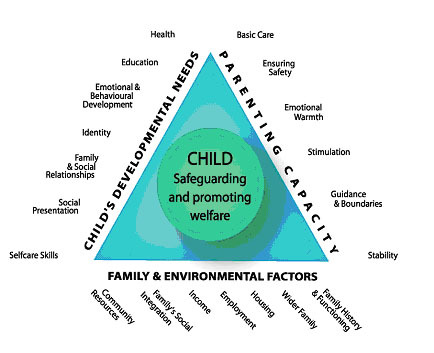 Based on the above factors the Assessment should establish the level of need and intervention required as outlined in Lincolnshire Safeguarding Children Board Procedures Manual, Putting Children First (Meeting the Needs of Children and Families in Lincolnshire). The child should participate and contribute directly to the Assessment process based upon their age, understanding and be central to the Assessment. They should be seen alone and if this is not possible or in their best interest, the reason should be recorded. The social worker should work directly with the child in order to understand their views and wishes, including the way in which they behave both with their care givers and in other settings using the Signs of Safety based tools to assist in the Assessment process. The parents’ involvement in the Assessment will be central to its success. At the outset they need to understand how they can contribute to the process and what is expected of them to change in order to improve the outcomes for the child. The Signs of Safety based methodology tools will greatly assist in the Assessment process. The Assessment process must be open and transparent with the parents. The parents' views should be sought but should be verified from other sources of information. Any inconsistences should be challenged and verified, all practitioners should have a level of professional curiosity. All parents or care givers should be involved equally in the Assessment and should be supported to participate whilst the welfare of the child must not be overshadowed by parental needs. There may be exceptions to the involvement in cases of Sexual Abuse or Domestic Violence and Abuse for example, where the plan for the Assessment must consider the safety of an adult as well as that of the child. Taking account of confidentiality, provided to professional referrers. The maximum time frame for the Assessment to conclude, such that it is possible to reach a decision on next steps, should be no longer than 45 working days from the point of Referral. If, in discussion with a child and their family and other professionals, an Assessment exceeds 45 working days, the social worker and professionals involved should record the reasons for exceeding the time limit. The Social Care Assessment is to be completed and sent for authorisation on day 40 (i.e. 40 working days from the point at which the assessment was initiated). Not all cases will require a full in-depth Assessment, therefore in discussion with the Line Manager the case will be reviewed and a decision made by day 15 (i.e. 15 working days from the point at which the assessment was initiated) if the case is closing, transferring to TAC or elsewhere, or if it does require a full in-depth Assessment. It is important that all practitioners working with pregnant women / women of child bearing age are aware of assessment needs and of routes of referral in order to facilitate engagement, care and intervention in accordance with the Safeguarding Policies and Procedures. If it is agreed that the unborn child maybe a Child in Need or child at risk under the Children Act, then a referral should be made to Children’s Social Care at 20 weeks. Prior to this service provision should be co-ordinated through the TAC. Families should be informed of concerns and referrals, unless it is felt that to do so would put a child, unborn child, or other person at risk of harm. All information should be shared in accordance with best practice and the LSCB Information Sharing Protocol Team Around the Child (TAC) and LSCB Procedures. Please refer to the LSCB, Pre-birth Protocol and Appendix 1: Pre-Birth Flow Chart for all Professionals that Identify Additional needs for an Unborn Baby. Records should be kept of the 15 day Case Decision and 40 Day Review and if any other significant event occurs during the assessment and this will be updated on the day. See also Working with Foreign Authorities: Child Protection Cases and Care Orders, Departmental Advice for Local Authorities, Social Workers, Service Managers and Children’s Services Lawyers (DfE, July 2014).